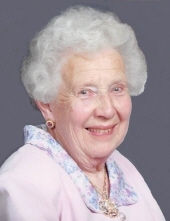 Helen Fromm Kannenberg, 98, went home to her Lord on Sunday, April 7, 2019. She was born on January 1, 1921 in the town of Cedarburg to Walter and Ella Hilgendorf Fromm. Her early years were spent in the apple orchards and gladiola fields of Fromm Orchards. On June 27, 1942 she married Harlin Kannenberg at Immanuel Lutheran Church in Cedarburg. Helen and her husband farmed in the Town of Jackson until retiring in the mid 1990’s. They celebrated their 70th wedding anniversary in 2012. Helen was a lifelong member of David’s Star Lutheran Church. Christ was her light! Helen lived her light. She always saw the good side of everything -never the bad. She had an infectious smile and was an inspiration to all! Helen was very active in the Ladies Aide and served as Treasurer for many years. She was a former Sunday School teacher, and a member of the local Farm Bureau. She and her husband enjoyed polka dancing, playing Sheepshead, and weekly visits with family and friends. Helen always had a huge garden, and loved to bake and entertain. Survivors include children Carol (Ted) Meyer of Saukville, and James (Anne) Kannenberg of Jackson, Dan (Mary) Kaschner of Jackson, adopted in friendship. She is further survived by her grandson Russel Kannenberg of Jackson, her brother-in-law Jerome Kannenberg of Kingman, AZ, one niece, four nephews and many very special friends. A Funeral Service for Helen will take place at 1:30PM on Thursday, April 11, 2019 at David’s Star Lutheran Church (2740 David’s Star Dr. Jackson, WI 53037) with Pastor Michael Woldt & Pastor Kurt Loescher presiding. The family will receive visitors at church from 12:00PM until the time of service. In lieu of flowers, memorials to David’s Star Lutheran Church or School are appreciated. Special thanks to the staff at Lasata Crossings and Lasata Care Center for their compassionate and loving care for the past 6 years. "Email Address" would like to share the life celebration of Helen Fromm Kannenberg. Click on the "link" to go to share a favorite memory or leave a condolence message for the family.